It seems that the second generation Nexus 7 has been on sale a lot lately, but we are not complaining. Woot! is the latest to discount the 7-inch tablet, offering factory reconditioned (e.g., refurbished) units for a mere $139.99. Needless to say, they are the 16GB, WiFi variants. While not quite as good as the sale eBay held a few days ago, the Woot! price is still nearly a $100 off full retail. That’s not bad for a tablet packing a Snapdragon S4 Pro processor and 1920 x 1200 display that continues to receive support from Google, including access to the Android L developer preview. 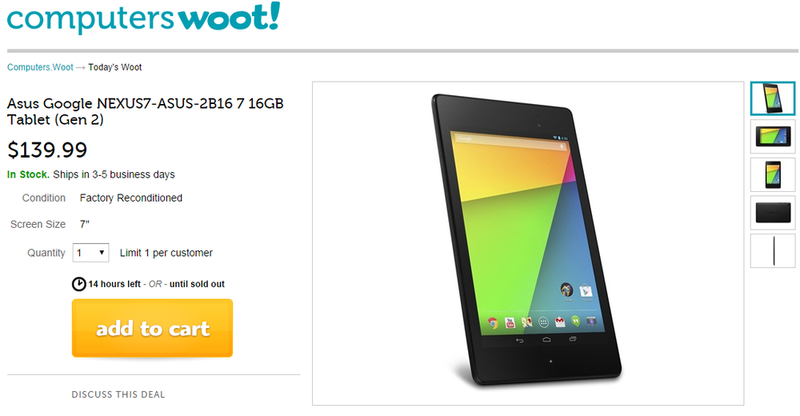 If you are interested in picking up a Nexus 7, better hurry – items on Woot! tend to sell out fast.